Prior to TIGER’s arrival our staff will send you information that will guide you through preparing your students and staff for the TIGER visit. The TIGER staff is always available to answer any questions or provide advice on making the TIGER visit as powerful as possible. After the show, TIGER staff will be in touch to get your feedback, answer any questions, and provide additional information and resources. 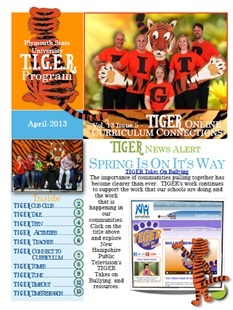 TIGER emails Curriculum Connections to all schools booking TIGER, to be distributed throughout the school community. Each newsletter includes: activities for children of all ages, teacher insights, reading suggestions, updates on legislation, and the music for a favorite TIGER song. The online curriculum welcomes suggestions and content submissions.